As the biggest of the 32 dolphin species, the orca is able to run riot with present-day marine mammals. Even the large baleen whales are not beyond its hunting abilities. Well-known to most sailors because of their ubiquitous distribution, they have also been called "wolves of the sea," and assassin whales when seen hunting these cousins. They have even been known far up large rivers and estuaries such as the Rhone, Elbe and Thames, hunting anything from fish (65 per cent of the average orca diet) to seals. They have more than 40 large, recurved teeth with which to capture and bite in various modes. The modus operandi for much of their feeding behaviour involves high intelligence and even play. With one of the greatest brain/body size ratios known, these whales are probably the most adaptable alive. There are certainly at least two basic habits: the resident pods of an area which specialise in fishing, and transient groups, which are more likely to eat mainly marine mammals. These two groups are said by experts to be forming a deep split leading to two varieties and eventually, two different species. Herding prey and multilateral attack are two simple strategies that are often seen. More complex tactics have been researched extensively, such as the successful toppling of seals from ice flows. The unfortunate prey is knocked off the ice by waves made by the actions of collaborating orcas. With cosmopolitan distribution, there are several races such as the quite isolated ray and shark-eating New Zealand groups. Females become mature before ten years, with males tending to mature sexually after this. Gestation takes 17 months, which is longer even than the baleen whales. Weaning is at 12 months. The attractive black and white markings have often been used for scientific and other identification. Here a breaching whale shows off his beautiful "magpie" pattern, easily identifying him to those who know of him, including perhaps other orca! In ecological terms, the orca's niche is at the apex of marine food pyramids. As such predators, they are as vulnerable to pollution as birds of prey were in "Silent Spring." 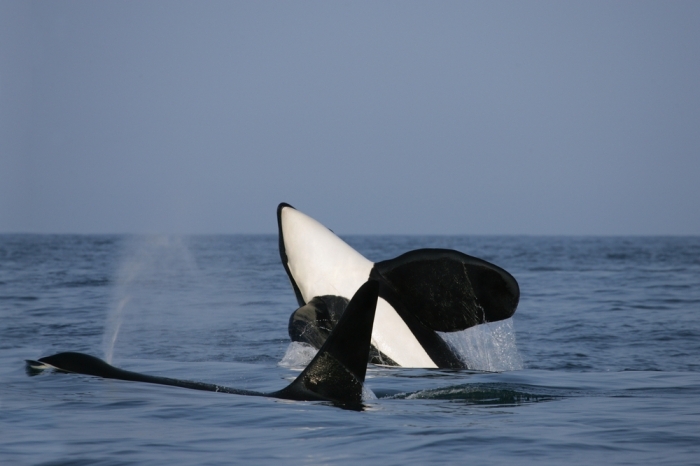 PCBs and thousands of other pollutants have been building in orca's prey since WW2.